It’s rainy, it’s muddy, and it’s an old fashioned hard-hitting AFC North Showdown. 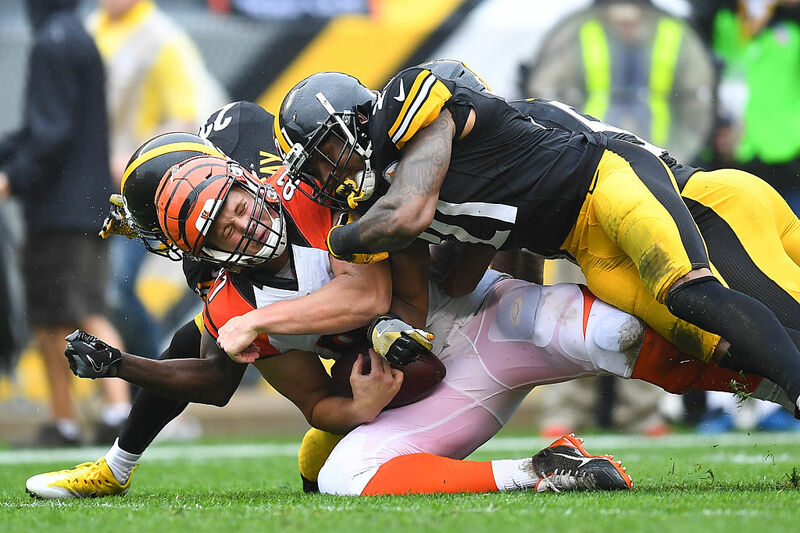 That’s the way the Steelers and Bengals would have it early in week two of the 2016 NFL season, today the two clubs are having a nip and tuck affair at Heinz Field, where at the half the Steelers lead the Bengals 10-6. It’s been a day of ‘what ifs’ and close plays, and here’s some first half thoughts on what we’ve seen thus far from the Steel City. * DeAngelo Williams has gotten off to a good start, but it seems like Todd Haley went away from him as the half moved along. Don’t forget the Bengals gave up a huge amount of running yards to the Jets a week ago, and the Steelers need to remember that. On a day when the weather isn’t all that great in favor of throwing all day, Haley can’t fall to much in love with Ben throwing the ball every down. * The team missed a few chances on defense in the first half, but the biggest was the play where Jarvis Jones on 3rd down should have picked off Andy Dalton. A pick there and the Bengals don’t get the last play three from Mike Nugent, and while the Steelers probably would have run the clock out, it would have stopped any momentum Cincy gets as we enter the third quarter. * The offense has had their issues, and they have had a few possessions with good field position that they have gotten nothing from. If the Steelers are going to win, they have to do a better job of converting on those chances, and make sure they keep their foot on the gas of the Bengals, and score touchdowns and not just field goals when they are in the Bengals red zone. * Ben is just 9-for-21 with two picks, and he’s run for his life a number of times due to the pressure the Bengals have brought. The O-line has to do a better job of keeping Ben upright, and also Ben himself can’t made bad decisions, like the second pick in which he just heaved the ball up and was hoping that Sammie Coates would make a play. This is very much like the game a season ago in which the Steelers lost it late 16-10 – let’s hope the outcome is different this time. Be the first to comment on "Quick First Half Thoughts as the Steelers Lead the Bengals 10-6"